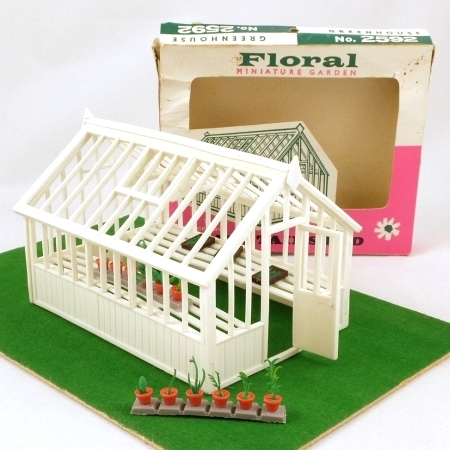 This greenhouse is a great centrepiece to a Floral Garden display. With staging on both sides and opening door, this example is a nice bright white and is complete with all of its parts including the roof finials, the two roof braces and the door handle. Included with the greenhouse are three seed trays with seedlings, and twelve potted plants. It comes in an original box which is in fair condition; the inner plastic bag is not original! Supplied packed flat for easy clip-together assembly.